The PUD trims trees that grow too close to the PUD’s power lines. Power poles also carry cable tv and telephone lines, but it’s easy to tell power lines apart from these types of lines – power lines are always higher up on the pole, they always have insulators, and they don’t touch other lines. Cable and telephone lines are located further down the pole and are directly attached to the pole without insulators. If you are unsure whether you are looking at a power line or a cable tv or telephone line, always assume it is a power line and could electrocute you! 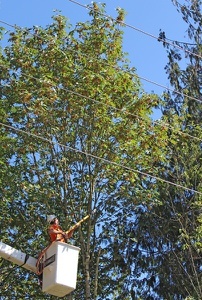 Our tree crews trim branches that are growing too close to power lines. If your home is connected to the PUD’s distribution system by an overhead service line, it’s your responsibility to periodically check to ensure that trees are not growing into the path of the wires. When Do Trees Become a Problem for Service Lines? Tree limbs occasionally brushing the wires will not damage a service line. But a tree limb or trunk that is growing into a service line will need our attention for trimming or removal. This kind of interference can lead to damage to electrical equipment in your home if it’s not taken care of. You can help us identify service line problems before equipment is damaged. If you have trees growing into your service line please contact us. We will inspect your service and, if necessary, trim or remove trees that are growing too close. Do not attempt to trim trees that are growing near power lines or service lines yourself – doing so can put you at risk of deadly electrical shock. If you find trees that need to be trimmed, either fill out the form below or contact operations@crpud.org and provide your name, service address, phone number and a description of the tree trimming work that needs to be completed. Use the following form to request tree trimming services for trees growing near PUD power lines. Please provide as much information as possible so we can correctly identify the area to which you are referring. Please provide as much detail as possible about the trees you want us to trim and where they are located. We need this information to be able to correctly identify the trees in question. If possible, please mark the trees with paint or tape and indicate how you have marked them in your description. For more information, contact the Operations Department at (503) 397-1844 or visit our office in Deer Island.